The First Federal Lakewood instant issue debit card lets you walk out of the branch with your new card the same day! 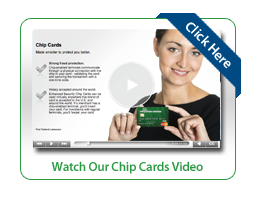 There’s no wait for your card to be mailed, you can select your own security PIN, EMV chip technology is built in, and you get instant access to your money. It’s the safe, secure way to make purchases virtually anywhere, whether in store or online. Paying at the register or within an app has never been easier or safer. Using your iPhone or Apple Watch, you can quickly pay in stores that accept contactless payments or within apps displaying the Apple Pay logo. It’s accepted at millions of locations, and it’s easy to set up your First Federal Lakewood debit card as your default payment method. Apple, the Apple logo, iPhone, Apple Watch, and iPad are trademarks of Apple Inc., registered in the U.S. and other countries. Apple Pay and Touch ID are trademarks of Apple Inc.
Instantly receive alerts for card transactions. Establish transaction controls based on threshold limits, merchant categories, transaction types and specified locations. Review card-based transactions for the cards enrolled in CardValet. Turn a card On/Off —especially useful for lost or stolen cards. When the card is Off, no purchases or withdrawals will be approved except for previously scheduled recurring payments. Check balances for the accounts associated with the cards enrolled in CardValet. Download the CardValet app in the App Store or Google Play Store today! Get the cash you need, whenever you need it. The nationwide MoneyPass® ATM Network and your First Federal Lakewood card let you access your accounts wherever you live, work and travel – completely surcharge-free. ATMs are also searchable on FFL.net or moneypass.com!